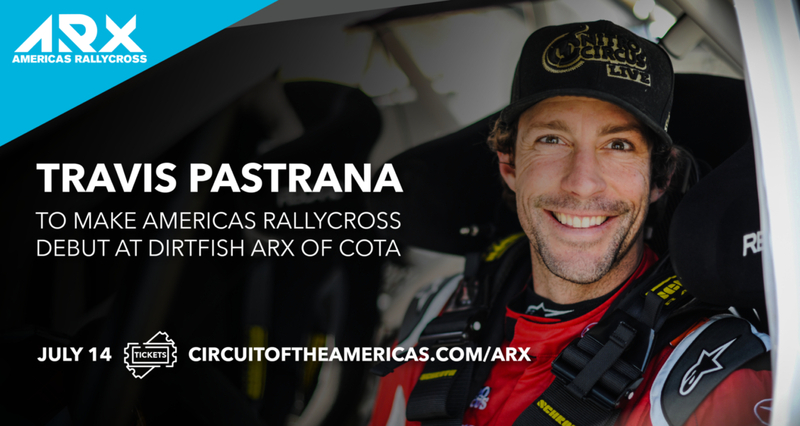 17-time X Games medalist, Guinness World Record holder and creator of Nitro Circus, Travis Pastrana will make his Americas Rallycross (ARX) debut at Circuit of The Americas (COTA) on July 14. "I can't wait to get back into the 600hp Subaru WRX STI rallycross car in Austin with the ARX series," said Pastrana. "Rallycross is a blast and fans are going to enjoy the track and all the action at COTA, I'm really looking forward to it." After a successful debut at Speedmachine Festival in May, ARX will debut in North America under the lights for the DirtFish ARX of COTA. Pastrana will compete alongside Subaru Rally Team USA teammates Patrik Sandell and Chris Atkinson in the Subaru WRX STI. The July 14 event will mark Pastrana’s first rallycross event since 2015, which was also at COTA as part of X Games. Now, the 34-year-old action sports star will race against familiar foes Tanner Foust, Ken Block, Scott Speed and Steve Arpin on a permanent half-mile rallycross circuit, nestled in turns of the 12-15 complex. The track features over 1,000 feet of dirt and a high-speed jump leading to technical asphalt sections, creating some of the most exciting racing in motorsports.